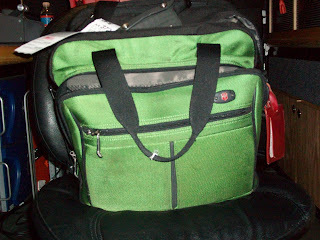 Meet the “Jet” bag – 20+ pounds of tapes, music, media guides, and ancillary production crap. It’s all heaped in there, and for the duration of the basketball season it is attached to my hip. I have to take it carry-on because I don’t trust the airlines sending it where it absolutely has to be. I even strap it into my rental car with a seatbelt. Sunday was the watershed moment. Carrying all this stuff – my lower back finally gave out. Any efforts to stretch it felt like trying to untie a pretzel with a wrench. I’ve been downing Advil like Dr. House, without letting the pain make me quite as surly with my team. Though I reserve the right to surliness, since nobody has offered to take this green albatross off of my shoulders all season. My wife suggests Bayer Back & Body – that’s the next move. In the meantime, I’m wearing sneakers to hoop game for the first time ever (I think) – it won’t score me any points in Holly Rowe’s Producer Style Power Rankings. Nothing like a two hour drive and a 5:30 AM flight home to iron out the kinks. It will be good to get back to the casa and give my back...time. Labels: Green, Holly Rowe, House M.D. That's what you get for making it to the mountain top! Stop your whining you get compensated for it. Also just an FYI for anyone that thinks they want to produce for ESPN you have to stop and think... "do I really want to wait for luggage at the baggage claim". It wouldn't hurt if you tried working out every now and then! Eric--Put the Advil away. House is right. Go Vicodan with a little Soma to make you loose. It'll make you giggly though, so work that out before you go live. "Going Green isn't always healthy"